While it would be better if we could help our patients avoid dental emergencies altogether, these scary situations can be entirely unavoidable at times. When they do happen, already having a trusted dental practice in your corner can make a world of difference. At Boyles General Dentistry & Implant Center, our dentists strive to treat patients urgently in need ASAP. Contact us today to schedule an emergency appointment here in Midland, TX. Remember to schedule a checkup and cleaning here at our Midland practice every six months! 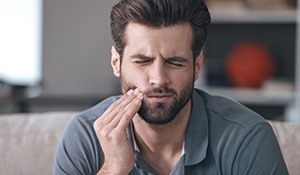 Many dental emergencies develop gradually over time, which means that our team can spot and treat the warning signs before they ever develop into a serious matter. Limit your exposure to foods that are overly sticky, chewy, or tough. This includes hard candy and popcorn kernels. Also, refrain from chewing on the ice in your drink and don’t chew on pencils as a habit. Always wear an oral appliance (preferably a custom-made one) if you regularly play sports with physical contact or suffer from bruxism (teeth grinding). Use scissors to open tricky packaging, not your teeth. Remember to brush at least twice a day and floss at least once. These are necessary steps for getting rid of decay-causing food particles and plaque.